The 1.6L version of the Gamma engine family has the following versions - G4FA, G4FC, G4FD, G4FG, and G4FJ. The first Hyundai’s 1.6L Gamma engine was the G4FC – a 1.6-liter four-cylinder gasoline engine with multi-point fuel injection introduced in 2007 which became a common engine option for Hyundai’s and KIA’s compact sedans and hatchbacks like Hyundai Accent, Elantra, KIA Rio, and Ceed. The 1.6 MPI G4FC is based on a smaller 1.4-liter version in the Gamma family – the G4FA engine. The 1.6L displacement was achieved by installing a new crankshaft with increased stroke (from 75 mm up to 84.5 mm). The 1.6l engine has longer connecting rods and its own pistons (compression height differs from 1.4l engine pistons). The G4FC is also completely aluminum; it has an aluminum open-deck cylinder block and 16-valve double overhead camshaft (DOHC) aluminum cylinder head. The 1.6L G4FC is equipped with continuously variable valve timing system named as CVVT for the intake timing only. The camshafts are chain driven. There are no hydraulic cam followers (valve clearance adjustment is required every 60k miles/100,000 km). The fixed geometry intake manifold is made of light-weight and cheap composite material. The engine used a multi-point fuel injection (MPI) controlled by electronics. As you can see, the G4FC is a straightforward engine by modern standards. In 2010, the G4FC was replaced by the G4FG engine – the 1.6L version of the upgraded Gamma II family. The G4FG engine is still equipped with a conventional MPI but also has noticeable divergences. The first is the new engine got dual CVVT system (variable valve timing for the exhaust and the intake camshaft is used) and the second is the variable geometry intake manifold (Hyundai’s VIS system). New features raised the power and efficiency and brought a new life for the cheapest 1.6L Gamma engine. The 1.6 GDI engine named as G4FD, was firstly introduced in 2008. It became the first Gamma engine which uses direct fuel injection. The engine got entirely redeveloped cylinder head with direct fuel injectors in combustion chambers and the high-pressure fuel pump mounted on top. The high-pressure fuel pump is driven by an additional four-lobe cam on the exhaust camshaft. The engine is equipped with an advanced Dual CVVT system which helps to eliminate a high risk of detonation caused by increased compression ratio to 11.0:1 for efficiency. The engineers also applied the Variable Induction System (VIS) – the variable geometry intake manifold delivers a variable airflow based on speed conditions. The 1.6 GDI G4FD engine has greater fuel efficiency and power output together with low emissions. A turbocharged version of the G4FD - the G4FJ or 1.6 L T-GDI, was introduced in 2011. The G4FJ engine features a twin-scroll turbocharger, air-to-air intercooler, direct fuel injection system, dual CVVT system, new pistons, and 9.5:1 compression ratio. 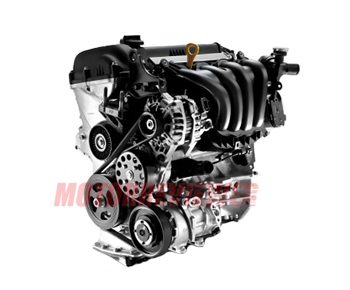 Hyundai’s 1.6L engine is similar to the 1.4l Gamma engine in terms of reliability and common problems. The all 1.6l gamma engine feature noises, whistles, knocks and periodical problems with idle and vibrations. The oil starts leaking under the cylinder head valve cover at 30-40k mileage (a new gasket is required). The intake manifold quickly becomes dirty inside caused the unstable idling and power loss. Special cleaning products and procedures are available for cleaning channels and throttle valve. Oil leakage from a turbocharger on the 1.6 T-GDI engine happens rare, but if it does, it is at very low mileage. In general, the engine does not deliver serious problems with provided proper maintenance and use of good fuel/lubricants. The engine life is slightly over 125-150k miles (200,000-250,000 km). G4FC - 123/128 hp (91/96 kW) at 6,000 rpm, 116 ft-lb (157 Nm) at 4,850 rpm. The 123 hp version is the 1.6L MPI Gamma with single CVVT; the 128 hp engine – the Gamma II engine with Dual CVVT system. G4FG - 130 hp (97 kW) at 6,300 rpm, 116 ft-lb (157 Nm) at 4,850 rpm. The G4FG engine is equipped with Dual CVVT system and VIS. G4FD - 138 hp (103 kW) at 6,300 rpm, 123 ft-lb (167 Nm) at 4,850 rpm. This is the Hyundai 1.6 GDI engine. G4FJ - 177/204 hp (130/150 kW) at 6,000 rpm, 195 ft-lb (265 Nm) at 1,500-4,500 rpm. The G4FJ is the most powerful version in 1.6l Gamma series. It is known as Hyundai 1.6 T-GDI engine.